April is the month for migrating ducks and May is the month for migrating warblers. A lot of the ducks are quite ugly to be honest! And they fly away at even your tiniest most quiet footstep, when you’re behind trees and far across the water from them. When something tries to evade you so hard, it makes you try anything to just get a picture of it.In the spring of 2009, I despaired at not being able to capture any ducks because my camera lenses was not long enough. I figured I’d had to wait to afford something bigger. But then I joined a prayer group on facebook. About 7 or 8 people that wanted prosperity, joined this group, and each person received a full week of prayer. The results were amazing. People shared miracles that happened to them during this time period. I always figure, I need all the help I can get, and I like helping other people, so praying for them and receiving their prayers is a win win situation. The week that people were praying for me, I went to a nature center where there was a body of water. I started walking towards the water because I saw some ducks. Usually that makes them fly away. But I inched my way forward, slowly. And for some reason they stayed. 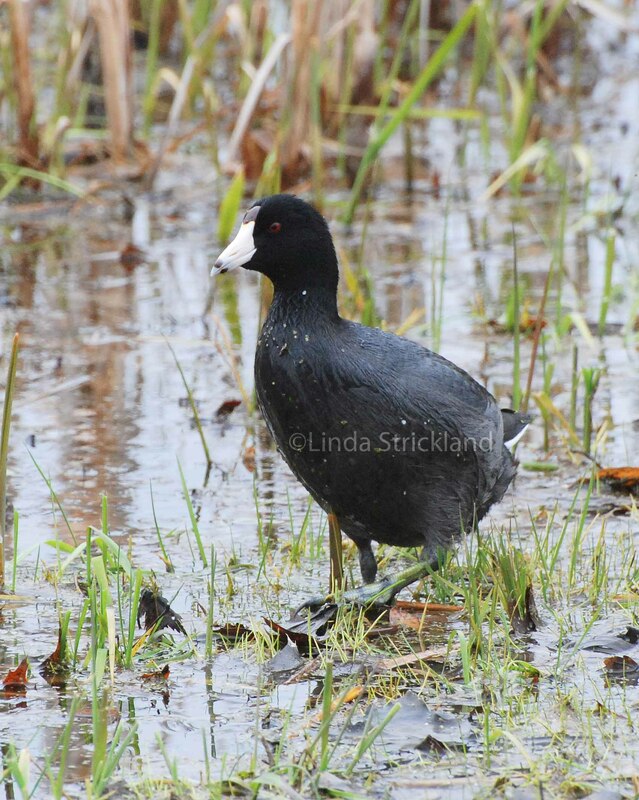 In fact an American Coot started walking towards me! I have always wanted to see their big ugly green feet. 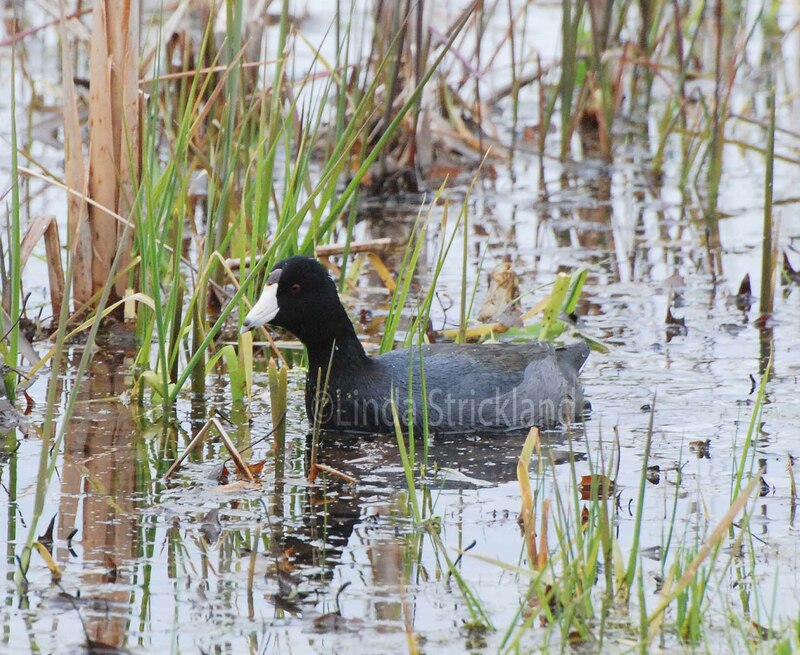 And this dream was made possible when the above coot started coming towards me! I barely held my breath as he continued his walk, and I clicked away. Eventually he did move on. But I got so close to him, it was a moment I will never forget. That week also brought a bunch of other good things too. I got into 2 difficult art shows, and met a black and white film photographer in Wisconsin who showed me his private collection of barns in the area. It was amazing. The whole week I just kept expecting things to go well. And they did. I think of prayers as good energy and good thoughts that people are sending your way. And when someone is concentrating on you for even a week, the results are amazing. And you get to give back, when you pray for them. Bring prayer into your every day, over even the most mundane things. Why not? Do you want that parking spot in a crowded parking lot? Go for it. Is your car old and you just want to make it from point A to point B? Ask for help. Do you not have enough money to get through the week? You will make it. Ask and just have faith. Sometimes the miracles will be big green feet coming out of the water! Other miracles will take more time to manifest. Keep that good energy going. No matter how you feel. It’s the only way to get through the day. Thank you Sonel! I wish for you a telephoto lense on your birthday! or xmas, or some celebration day in the near future. Wish we were close enough that I could go out shooting with you. Just a few continents in the way! hehe. What a beautiful ‘ugly’ duck. 🙂 Nice photo! I believe that creatures of every kind recognize and warm up to Love. When you’re open and sincere, Trust is born. Glad you got to experience such closeness! Because of you, we get to experience it too…. Thank you John! In my memory he was a beautiful duck because he let me so close to him, if only briefly. Thank you for that affirmation. I did feel as if I was warming up to Love. with a capital “L”! Truly. Thank you djmrakiey! Indeed they are.